Ecommerce has been the great equalizer for retailers—a small book store in Iowa can oftentimes compete with Barnes & Noble, Borders, and Amazon for customers in New York, Los Angeles, Chicago or the world, but equality isn’t always good. There are times when it’s good to have a competitive edge (inequality), and if you act fast this could be one of those times. MarketingSherpa, one of the Internet’s most reputable marketing sites, has offered up seven tactics for boosting online banner-ad response rates. 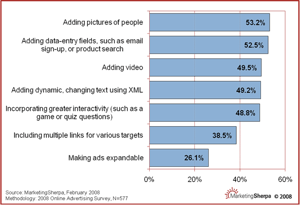 MarketingSherpa’s findings are based on a survey the firm conducted. These findings generally show “how seven design elements have an impact on the effectiveness of online advertising,” especially as compared to response rates for regular or commonplace online banner ads. For this article, these seven tactics are divided into three groups of suggestions. The MarketingSherpa survey found that a picture of a person is worth a 53.2-percent leap in ad response. And they aren’t alone in their findings. In 2005, Yale University, Harvard University, Princeton University, the University of Chicago, and Dartmouth College jointly analyzed the results of a massive marketing test in South Africa wherein a bank sent 50,000 potential customers a loan offer. The loan offers included various interest rates and repayment options as well as randomly selected “psychological features”—including a subtle photograph of a person in the corner of randomly chosen offers. These psychological features had no real bearing on the loans. Not surprisingly, offers that promised lower interest rates got more takers than relatively high interest offers, but the photographs also had a strong effect on response rates in some cases more than doubling the number of customers that took the loan offer. Editor’s Note: A mini-marketing experiment: Did you notice that we chose a picture of a young woman for the icon that represented this article on our article page? Do you think it had an effect on you? And did you click the headline or the picture? Submit your answers and thoughts in the comment section below. MarketingSherpa’s next two tactical suggestions, adding data entry fields and adding video, fall into what the Sherpa called “Utilitarian” design categories, but somehow “Utilitarian” just doesn’t seem like the proper term for an online ad design tactic that could boost responses by 52.5 percent. And remember, Internet video use is growing rapidly. comScore, an Internet intelligence company, reported that Internet users watched more than 10 billion videos in December 2007. That is about 3 hours of online video a month. Furthermore, online ad king, Google, has added click-to-play video ads to its offerings. According to MarketingSherpa, adding dynamic, xml-driven text to ads; incorporating interactivity; including multiple links; and making an ad expandable will improve responsiveness by 49.2 percent, 48.8 percent, 38.5 percent, and 26.1 percent respectively. “Adding drivers, such as more dynamic text, helps match relevant messages to more exposed individuals, reducing wasted media” MarketingSherpa said. Add pictures of people to boost response 53.2 percent. Add data-entry fields and get 52.5 percent more clicks. Add video and watch your response rate climb 49.5 percent. Add dynamic XML-driven text to take note of a 49.2-percent boost. Incorporate interaction for 48.8 percent more click-throughs. Link to multiple targets and see hits jump 38.5 percent. Make ads expandable and grow your responses by 26.1 percent.